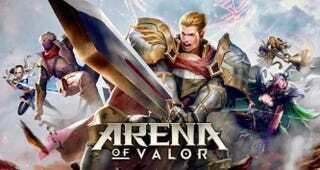 Arena of Valor.........looks pretty generic, right? I try and play every free online game that comes out on Switch because 1) they’re free, so why not? and 2) I’m always on the lookout for that online multiplayer game that will be fun for a bit until the next one comes along. So far I haven’t played any on Switch that interest me. A lot of free to play online games are just rehashes of other games I’ve played before and never hold my interest. Yesterday I downloaded the new free to play Arena of Valor and I was surprised to find that I had a lot of fun playing it! I’ve played a lot of MOBAs (Multiplayer Online Battle Arenas) - a team versus team game where players choose one of many archetypal heroes to battle their way through lanes of combat on a map to destroy defensive structures and eventually the enemy town itself. I played easily over a thousand hours of the original DOTA custom map and got very good at it. I played League of Legends for a few years near its beginning and dipped into Dota 2 and Smite both of which I found, after years of online gaming, too competitive and stressful. I’m too old now to be really good at these games any more, I have absolutely no desire to play for hours and hours every night to get better and learn the characters, and I just don’t have the time. I did play Heroes of the Storm for a bit and its more casual play scratched a MOBA itch I still have. Arena of Valor gives me a similar feeling with a few differences that I think boosted my enjoyment of it. Chaugnar is a playable hero in Arena of Valor. If you think I’m not gonna play an elephant with demon wings you are VERY mistaken. Heroes of the Storm and Arena of Valor both come to casual MOBA play from different angles. Heroes of the Storm just straight up removed a few levels of complexity from the game - no items, no profile equipment, no profile ability trees, no individual leveling or gold farming, etc. This definitely worked well in the game, but I always kinda missed the fun in trying out different items. Arena of Valor has left most of that in, my profile most closely resembles my League of Legends one. There’s arcana: equippable gems that offer a variety of bonuses (+regen, +armor, etc.) that increase with the quality of the gem and there’s a page where you can select an array of gems to equip all at once to mix and match bonuses. There’s also one bonus skill with a long cooldown you can equip (ie: sprint, blink, execute etc). There’s also an equipment page where you select individualized item purchasing paths for different heroes making it MUCH easier to buy items for new players. It comes with suggested items to buy that are actually good and makes navigating the shop during a game significantly easier. Arena of Valor’s attempt at more casual play comes primarily from its combat. I found the targeting and auto-targeting systems to be very fluid and easy to use. I didn’t find myself needs a very high level of skill to hit another player with an ability. The auto-attack priority also works really well: when you’re in range of a hero you attack them, when you’re not you attack everything else. A target appears under whatever hero or creature you’re attacking and automatically swaps to a hero when in range. This attack feature on a controller also feels very smooth with your movement controlled via an analog stick. I have to test more how well this works with team fights, but there’s some natural mechanics in there that help you target who you want to hit. I’m not sure if it’s based on the direction your hero faces or something else, but I didn’t find it difficult to target a low health player with their teammates around. Cresht is a playable hero in Arena of Valor. If you think I’m not gonna play a sharkman with an octopus beard you are VERY mistaken. The combat is also relatively quick without feeling very unfair. Since gold and experience seems to be relatively steady (you need only to be near a non-hero unit when it dies to get gold and exp) the game seems to strike a decent balance where no one hero ever felt significantly over leveled or had significantly more expensive (and better) items. Heroes also all have 1 passive ability, 2 activated abilities, and one ultimate ability, which is less than any other MOBA I’ve seen. This small change, combined with easy targeting, and faster battles, makes a more casual but still fun combat experience. If this makes any sense at all, the combat feels like the Rocket League of MOBAs: many abilities are similar, and there’s less of them, so it’s really all about the timing. All this simplified combat and balanced leveling/items combines with low health towers to make a faster game - a key element for the casual player. I can’t tell you how many MOBA games I played where games lasted 45-55 minutes and were ruined by leavers or one small mistake at the end. All my Arena of Valor games ended between 15-20 minutes, making it far less stressful. Whether all this will last with time...who knows. People are still new to the game - it may get hyper competitive, it may be significantly harder at higher levels where pay to win becomes more of a factor due to the high cost of high level arcana. And yes, it is just another MOBA and it’s just another F2P game that’s been done before. I honestly don’t even know if I would call it a “good” game, but it definitely does scratch that MOBA itch for me in a pretty non-stressful and way, which is rare for online games. Right now, while it’s new, is a good time to download Arena of Valor and give it a shot. Who knows how long my interest will last but it works for now. Let me know what you think! Toro is a playable hero in Arena of Valor. Look - this guy is CLEARLY a Tauren so I’m all about him. He was the first character I played.